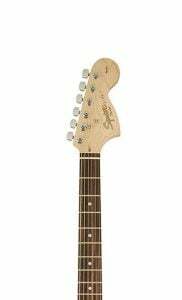 In the past, we have looked at Squier’s Affinity Stratocaster HSS, which was a longstanding part of our chart on the best affordable electric guitars. However, after a recent price rise, that is no longer the case. Thankfully, the all-single-coil Squier Affinity Stratocaster SSS is on hand to jump in and take its place, still coming in at under $200. There are no complaints in the design department here, as the Affinity Strat sports the traditional Stratocaster design, with its smooth contoured double-cutaway body shape. One important thing the Affinity Series has over the entry-level Bullet collection is a little more pizzazz in its aesthetics. This is apparent in the color choices, as the Affinity Series tends to offer more eye-catching and unique finishes than the entry-level Bullets. In the case of this Affinity Strat, you’ll find it in both a cool Surf Green and Competition Orange, as well as the more standard black, blue, silver, sunburst and red versions. Things like the headstock are also more attractive on the Affinity Strat, featuring the large ‘60s-style design with a two-color Squier logo. Looks aside, it’s also a pretty strong guitar for the price. The body is made from solid alder, while the bolt-on neck is crafted from maple. This features a comfortable C shape, a satin finish and a maple fretboard housing 21 medium jumbo frets. Looking at the Affinity SSS and the more expensive HSS side by side, you will notice one key difference – the bridge pickup. Here, instead of the humbucker, you get a third single-coil to complete the lineup. These are all still stock standard single-coils, which are nothing special but get the job done. As do the controls – there are two tone knobs, a master volume and a five-way pickup selector switch, for enough tonal versatility. The hardware is typical for an affordable Strat, with a six-saddle vintage-style synchronized tremolo bridge, with accompanying whammy bar. At the headstock, with a 6-in-a-line configuration, you’ll find six sealed chrome tuners and a synthetic bone nut just below. 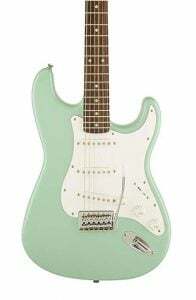 The trio of single-coils, while basic, offer a great Strat sound, with the classic sparkle. There’s nothing high-end about the tone, yet it’s very good when plugged into a decent amp and would cut through the mix when playing with others (depending on the amp of course). With articulate cleans, it proves a good choice for jazz, although the pickups provide enough bite when overdriven for blues and classic rock. However, those preferring heavier styles of music may prefer the HSS model, even at the higher price point. Take into account the price and the overall quality, and this Affinity Strat proves great value. It’s a step up from the Bullet Strat and worth spending the extra cash for a more unique color and headstock design. Ultimately, there are plenty of Stratocaster-style guitars in the budget markets, although with this genuine Fender-affiliated Strat, there are not many reasons to look elsewhere! 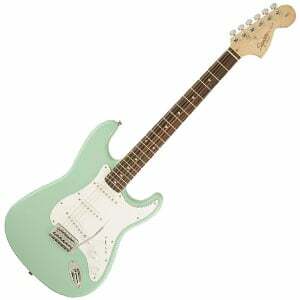 For more info about the Squier Affinity Stratocaster SSS, click here.